CenTrak’s universal infrastructure provides a single, common platform to enable all of healthcare’s use cases, making us the smarter healthcare technology investment. As an industry-leading provider of Enterprise Location Services™, we deliver a solution which is unmatched in accuracy, speed, performance and power-efficiency. Our offering is precise, versatile and cost-effective. They enable healthcare applications such as: security and protection, environmental and temperature monitoring, asset tracking/ management, patient/staff locating, hand hygiene compliance monitoring and business process automation, among others. Our Second Generation Infrared (Gen2IR™) technology delivers certainty-based location data, a requirement for workflow and other key healthcare management applications. Currently used at over 1,700 leading healthcare facilities in the US, Asia, Europe, Australia and the Middle East, CenTrak consistently provides superior Enterprise Location Services for healthcare featuring the latest in RTLS technology. Real-Time Location Systems (RTLS) and Global Positioning Systems (GPS) solutions are location-based services used in numerous industries, including healthcare, retail and manufacturing. RTLS offers a precise, indoor tracking system based on several technologies such as active radio frequency identification (RFID), second generation infrared, low frequency RF and Bluetooth low energy (BLE). Commercially available for 40 years, passive RFID identifies tagged objects and people using radio waves that are sent by a specialized RFID reader. Identifying information contained in a tag is detected only when in close proximity to the reader. In contrast to passive RFID technology is CenTrak’s Second Generation Infrared (Gen2IR) system. It’s an RTLS technology that is utilized in combination with active RFID to show an entity’s location in real-time. IR fills the defined space and the tags actively send a signal to communicate their location. CenTrak’s active RFID technology does not need bulky, expensive readers to interpret radio waves — it is simple to install and can be consolidated with an existing Wi-Fi system. In addition, CenTrak’s Gen2IR system rapidly solves many RTLS healthcare issues by efficiently streaming information to both new and existing applications. Applications benefitting from an active RFID-supported RTLS in healthcare settings include supply chain applications, especially those involved with high-cost devices such as infusion pumps, medical scopes and crash carts. 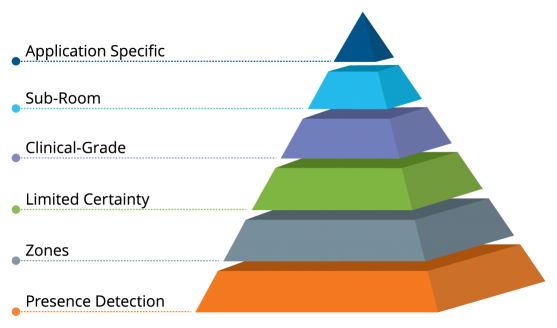 Each of these requires high levels of traceability from suppliers to hospitals to patients. RTLS solutions also reinforce quality assurance and control applications to facilitate instrument tracking processes for infection control. Asset tracking and management — All staff members can locate, in real-time, any item critical to patient needs. CenTrak offers the most accurate locating system available that also delivers condition updates and second-by-second interactions with staff and patients. Nurse call automation — Data contained in badges worn behind or in front of hospital ID badges gathers essential information, expedites emergency actions and streamlines communication between patients and nurses. Clinical operations and workflow — CenTrak’s Clinical-Grade Visibility™ technology replaces inefficient manual tracking systems with an automated system providing patient location, triage information, who is being discharged, who is receiving imaging services and dozens of other hospital department encounters. Patient safety — With location services for healthcare, patients no longer need to feel restricted to their room or floor. Moreover, staff knows exactly where patients are, which prevents them from wandering into dangerous or restricted areas. Environmental and temperature monitoring — Maintaining proper storage conditions conducive to infection control and diagnostic sample viability is essential to providing optimized patient care. CenTrak’s Smarter Sensor™ is a wireless environmental and temperature monitoring solution offering superior and accurate detection of even the slightest changes in environmental conditions. Staff security and protection — CenTrak Security Solutions combines the most accurate RTLS with industry-leading hospital staff security solutions to ensure healthcare facilities can instantly determine when and where help is needed to respond quickly. 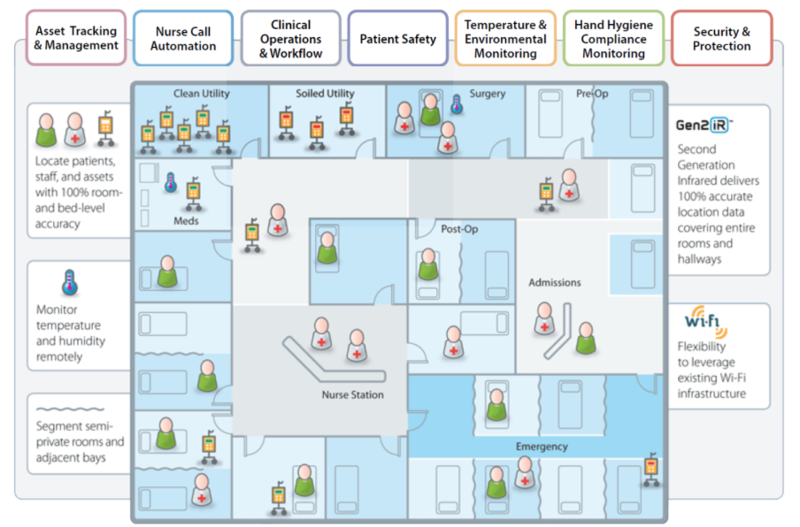 Hand hygiene compliance — Improving hand hygiene compliance utilizing an RTLS system can help hospitals reduce Healthcare Associated Infections (HAIs) and their associated costs. Reporting true compliance rates to hand hygiene protocols and offering reminders to staff in real-time provides a cost-effective means to increasing patient safety. Infant protection — Infants wear small tags that communicate continuously with staff to provide location visibility, prevent abductions, and support correct mother-baby matching. Types of tags include ankle band and umbilical attachment tags. Medical scope management — CenTrak’s Clinical-Grade Visibility technology provide staff with the ability to track the usage, cleaning cycle and storage information for medical scopes in use. Vital to ensuring healthcare facilities remain as sterile and pathogen-free as possible, accurate medical scope management also minimizes costs due to lost equipment, while streamlining clinical workflow and communication. Infection control—Controlling infection is absolutely essential. CenTrak’s clinical-grade RTLS solution tracks and manages unsterile utensils and surgical trays by location and their current stage in the sterilization process. Wayfinding—Navigating a hospital can be confusing and stressful for patients and staff. Wayfinding solutions make it easier to find your destination. What makes CenTrak the Smarter RTLS? Clinical-Grade Locating™ – CenTrak’s Second Generation Infrared (Gen2IR) delivers certainty-based location data covering entire rooms and hallways, rapid location updates, and extreme battery life. Faster ROI – Increase reimbursements, optimize mobile medical equipment management, improve utilization of resources, streamline workflow, reduce HAIs, and monitor temperature- sensitive consumables. Ultimate Flexibility – CenTrak’s RTLS is battery-powered, easy to install and can leverage existing Wi-Fi infrastructure. Its open location platform seamlessly streams data to both existing and new applications. Clinical grade visibility solutionsMulti-Mode Technology – A unique combination of Wi-Fi locating, CenTrak’s Gen2IR, and Low Frequency RF to future-proof investment and maximize ROI.